Fixed-wing aircraft is a term used to refer to what are more commonly known as aeroplanes in Commonwealth English (excluding Canada) or airplanes in North American English. The term embraces a minority of aircraft that have folding wings, intended to fold when on the ground, perhaps to ease stowage or facilitate transport on, for example, a vehicle trailer or the powered lift connecting the hangar deck of an aircraft carrier to its flight deck. It also embraces an even smaller number of aircraft, such as the General Dynamics F-111 Aardvark, Grumman F-14 Tomcat and the Panavia Tornado, which can vary the sweep angle of their wings during flight. In the early days of their development, these were termed "variable geometry" aircraft. When the wings of these aircraft are fully swept, usually for high speed cruise, the trailing edges of their wings abut the leading edges of their tailplanes, giving an impression of a single delta wing if viewed from above or below. There are also rare examples of aircraft which can vary the angle of incidence of their wings in flight, such the F-8 Crusader, which are also considered to be "fixed-wing". Sir George Cayley, the inventor of the science of aerodynamics, was building and flying models of fixed wing aircraft as early as 1803, and he built a successful passenger-carrying glider in 1853, but it is known the first practical self-powered aeroplanes were designed and constructed by the Wright brothers. (Indeed, the German Karl Jatho had already constructed such 4 months earlier and made his first flight August 28, 1903 in Hanover.) Their first successful test flights were in December 17, 1903 and by 1904 the Flyer III was capable of fully-controllable stable flight for substantial periods. Strictly, its wings were not completely fixed, as it depended for stability on a flexing mechanism named wing warping. This was soon superseded by the competitive development of ailerons, attached to an otherwise rigid wing. There exist different views on what was the first flying machine. There are many confident histories, with a large numbers of supporters, that have different views. This may be influenced by the fact that local heroes make more interesting histories, as well as national pride. Different definitions of first flying machine are emphasized, which leads to different claims. The people attempting to create the first flying machine were faced with many separate challenges, which required diverse skills. Develop theories on how flight works and invent a machine to fly. This requires the skills of a creative scientist. Construct the machine. This requires the skills of an engineer. Fly the machine. This requires a pilot, which -- before flight is achieved -- has to be someone intrepid, athletic and a quick learner -- the skills of an explorer. Trial and error. This requires someone with a lot of time and resources -- an investor. Recognition. This requires attracting notice, organizing a forum to demonstrate the invention and gaining publicity -- the skills of a marketer. Many of the people that attempted this succeeded only in some of these challenges. Since all the challenges were difficult, these are still notable achievements, rightfully touted in their respective cultures. But emphasis of only the challenges that were overcome is a source of producing different claims to the title of "first flying machine". The earliest attempts focused on the first challenges; they couldn't make much progress on the central challenges before the Industrial Revolution. Even then, most attempts borrowed from others' earlier work and still left work for others to finish. The next to last step, trial and error, can take years, and ideas can go back and forth between different groups, consciously or not. Since no one fully developed the first flying machine in complete isolation; it seems no one person or group had all the skills needed. 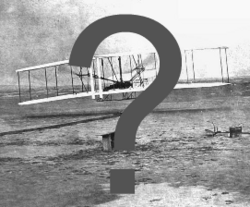 The best that can be claimed is that certain inventions were pivotal steps to realizing the age of flight. Even then, who achieved what step is still debated. This is a major source of controversy for early flying machines. There are parachutes, kites, lighter than air craft (balloons/airships), gliders and powered aircraft, which all have some ability to fly. The first use of each of these is worthy of note. But the definition of each of these is not universally agreed upon. The performance of some gliders was little better than slow falling, and might be considered more a type of parachute. Most early flying craft were light and fragile, and required the right wind conditions to fly. A headwind can give a boost to their takeoff. A tailwind will lengthen the apparent flight. Either might be considered unfair help from nature; almost anything will fly if the wind is strong enough. Some powered aircraft still needed a starting height or catapults to get them started, which might classify them only as engine-assisted gliders. Some inventions focused only on staying in the air, and had little or no ability to steer the craft, which makes them useless for practical flight. Other controversies include airplanes that derive some lift from attaching itself to other types of flying craft, becoming a hybrid. Even the definition of "flight" is not agreed upon. If a given flight only achieved a couple of metres of altitude, the craft may be taking advantage of ground effect, which is an aerodynamic effect that adds lift when very close to the ground. If the flight is only a few dozen metres in length, then it may be more due to momentum than lift; these might be considered only "hops" and not qualify as true flight. If the takeoff was from a height or was otherwise assisted, then how much was due to the craft's own lift is debated even if the flight was longer. The flight of a craft with little ability to gain altitude on its own may not be considered a true powered flight. If the flight ends in a crash, some discount the flight; the crash might be due to shortcuts taken in the construction of the craft, reducing its function or strength, which made the construction easier even if it made the craft impractical. There are other, more technical details about flight that can be source of endless technical debates. On the other hand, rather than specific, technical achievements, some claims to flight are more general. With the myriad of different challenges surrounding flight, succeeding in some is still an accomplishment. In truth, the more successful inventors built on the works of those who preceded them; those that did the earlier work deserve some credit. This is true even if their craft didn't fly successfully, or was only prototype that wasn't flown, or was only a model, a design, or just a sketch or theory. But saying "whose work helped others..." is not as often claimed as titles like "Father of Flight" or "Discoverer of Aeronautics". When designs, rather than flight are claimed, the classification of the craft designed gets all the more debatable, as critical details may be missing. For a claim to be accepted there must be some credible evidence. The number, quality and possible bias of witnesses are analyzed. There may be language and cultural barriers to analyzing the witnesses' reports. There may be cultural and philosophical barriers of the witnesses to overcome to even understand, much less properly report, the event they witnessed. Inventors skilled at marketing may be favoured because of more substantial evidence, even though such skills aren't usually associated with inventing flying machines. There is even an opposite effect, where a skilled "showman" can be accused of inflating claims or even falsifying inventions. More weight is given to photos of the flight, even though this favours claims taking place after the invention of photography. The number of flights is used to evaluate some claims in relation to others. If only a single flight was achieved by an invention, some dismiss this as a fluke. The more flights achieved, the more credible the evidence becomes, even though this favours inventors with more time and resources to invest. Damage to the aircraft on landings, and even injuries to the pilot, can be severe setbacks limiting the total evidence, even though they may be due to mere bad luck. For inventors that focused on skills other than science, their inventions can be dismissed because of the non-scientific nature of the evidence. To answer this, there are sometimes attempts to provide the missing scientific aspects to the evidence by recreations after the fact. In the more extreme cases, rough sketches are turned into complete flying machines. But there is no way to prove that the re-creators' modern knowledge didn't influence details of the recreation, improving the original invention. The same problem arises when aircraft are recreated in attempts to perform new test flights years later. Various governments and other organizations will often only give some claims an "official" approval in attempt to elevate one attempt over another, usually in the interest of a national or cultural pride. A great deal of disinformation and revisions can take place as well with some claims, both from individuals and governments, to adjust the level of importance of some respective claims. Minor mistakes or misinformation are sometimes widely reproduced without any further investigation. In the worst cases, some histories fail to mention the fact that counter-claims even exist, much less contrast them with a preferred claim. Flight can be defined as simply not falling when in the air. To do this, some force is needed to counter gravity. If a craft's countering force is not as strong as gravity, then the craft still falls, although slower. To rise from a starting point, the force must be greater than gravity. Since medieval times, rockets were known to provide sufficient energy, but were usually seen as too hazardous for manned experiments. The more common method involved a craft that is, in total, less dense than air. Before treated or synthetic materials were invented, balloons had to be made of many small pieces of natural materials, which couldn’t be made completely air-tight. This limited all early lighter than air craft to hot air balloons. However, such craft can only ascend and descend; they have little or no ability to steer, only work well in cold weather, and quite susceptible to drifting away in even light breezes. Although balloons fly, they are of such limited use that people continued to search for something with a more practical ability to fly. While useful flight is distinct from falling, there are many grey areas between them. Flying squirrels, for instance, can't sustain level flight, and may be doing little more than falling, yet what they achieve is certainly useful, since it is part of their natural adaptation for survival. The type of falling that merely avoids injury on landing is usually termed "parachuting". This simply requires increasing air resistance to the point where terminal velocity is low enough to make landing safe. However, the slower one falls, the greater time in the air, and the greater the influence of other forces relative to gravity. This means it doesn't take much effort to achieve distance from initial momentum, or even steering from minor adjustments to the shape of whatever is providing the air resistance. In recent years, use of parasails, hang gliders and similar craft have erased most distinction between parachutes and gliders. An aerofoil is a surface that adds lift when air moves over it. By the shape of the aerofoil, the air over the top is forced to move faster than the air under. Slower air has more pressure, so there is a net upward pressure on the aerofoil, which is lift. The wings of most gliders and aircraft are aerofoils, but kites use the principles of aerofoils also. There are various methods of getting air to move over an aerofoil. Forward motion makes the aerofoil move relative to the air. A headwind does the same. A kite is held stationary by a string, and wind moves the air over the kite. A helicopter uses rotating aerofoils. For flying machines that use aerofoils, the method of getting the air to move is used by some to classify the invention. Anything that falls can easily trade height for some forward motion, and get lift from aerofoils. A glider is usually defined as an aerofoil craft that relies on starting height rather than its own generated energy. But having an internal source of energy (an engine) doesn't always mean it is an aircraft rather than a glider; the engine may be so weak that it doesn't influence the craft's flight. How strong does the engine have to be before it is considered a true aircraft? A good breakpoint would be if the craft provides enough energy that it doesn't lose speed or altitude for a long period. But taking off at the start of a flight is a different situation; this often requires trading speed for height even on modern craft. Treating the takeoff separate from the rest of the flight has complications, as many craft needed ramps to help convert potential energy to forward momentum, catapults to give an initial push, or a starting height to allow a quick trade-off to forward motion. It is difficult to determine how much influence these extra take-off assistances had on the rest of the flight. Some craft didn't seem to need any obvious assistance, yet still required a headwind to add to the effect of the aerofoils in order to take off. Many people are certain about who invented the first flying machine, and are surprised to learn there are contrary views as adamantly asserted in other cultures. Some of these claims, when carefully compared, are found not to actually conflict, as different parts of the challenges of flight are claimed. But many claims do conflict, and are debated on either technical details of the definition of the invention or accomplishments, or the vague area of the relative importance of different achievements. Some claims are simply disbelieved. A few of the claims have been mistakes, intentional or not. This kind of controversy of invention is not limited to flight. For example, debates over the tallest building tend to break into debates around what constitutes a building and what is the most important measure of such structures' height. In the same way some records of flying machines can come down to the exact definition of what, for example, constitutes a "flying machine", or "flight", or even "first". No one single-handedly invented all of aviation. Early inventors made only partial progress, while later ones built on their work. Most of these claims are one that people can be justifiable proud of, but attempting to exclude all others' claims often leads to nothing but accusations of bias.